With the steady growth in the number and enrollment of Montessori schools around the world, certified Montessori teachers are in great demand. Montessori is not simply a method of teaching children to read; it is a philosophy of life! 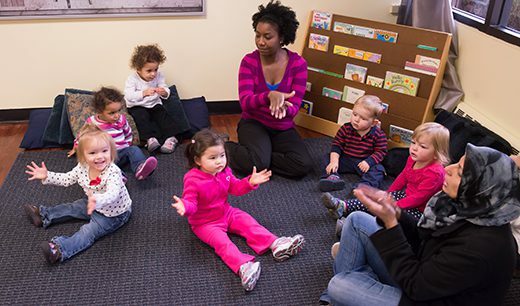 Montessori teachers come from a wide range of backgrounds. In many parts of the United States, a four-year college degree is a requirement to teach at an independent/nonpublic or public school at all age levels; however, except for areas where even independent/nonpublic school teachers are required to hold a state teaching credential, it is not necessary for prospective teachers to have first graduated with a degree in education. Many Montessori teachers studied another field first. Many parts of the United States allow teachers of preschool children to teach without the requirement of a college degree. Because these requirements vary from one place to another, prospective teachers need to check with either local schools or the State Department of Education to determine what the requirements are where they would like to teach. The same rule applies elsewhere around the world. It is essential to confirm national and state/provincial regulations. Many Montessori teachers began first as parents with children enrolled in a Montessori school. Often the very factors that drew enthusiastic parents to a Montessori school in the first place offer the possibility of a professional life beyond their roles as parents. It is common for enthusiastic parents to approach their children’s school, or are themselves approached, about the possibility of taking a course in Montessori teacher education. Montessori teacher education programs are available from hundreds of colleges and independent institutes across America and Canada. Courses are available in many other countries as well. Usually, Montessori teacher education programs involve a year or more of study. In the United States, many courses are organized into summer institutes, which can involve one, two or more summers of intensive study, followed by a supervised year-long practicum/student teaching experience. Other courses run during the school year. Each model has its loyal advocates, and selection of one over the other is a matter of personality and preference. Montessori teacher education programs are typically offered at the infant-toddler (birth to age 2), early childhood (ages 3-6), lower elementary (ages 6-9), upper elementary (ages 9-12), and secondary levels (ages 12-15 and ages 15-18). Most courses in the United States require a college degree; although, students who have yet to complete their undergraduate diploma may be able to take a Montessori teacher education course and receive a provisional Montessori teaching certificate. Tuition will vary from one program to another. Unfortunately the quality of Montessori teacher education programs can vary. One basic consideration is the credibility of the diploma received upon completion. Since 1995, the United States Department of Education has recognized the Montessori Accreditation Council for Teacher Education (MACTE) which is generally recognized as the essential sign of a program’s credibility. Since then, MACTE accreditation has become widely recognized around the world. Several Montessori organizations affiliate Montessori teacher education programs in the United States, and many more in other countries. Most, but not all, of their programs are also accredited by the MACTE commission. They include the International Montessori Council (IMC), the American Montessori Society (AMS), the Association Montessori Internationale (AMI), Montessori Educational Programs International (MEPI), and the Pan American Montessori Society (PAMS). A number of smaller Montessori associations and a number of independent programs also offer accredited Montessori teacher education programs. Distance Learning: Several organizations around the world offer blended residential and distance learning programs or correspondence courses, which allow students to complete some of their Montessori teacher education studies online. Keep in mind, that teachers in the United States normally graduate from colleges or teacher education institutes that offer a traditional face-to-face academic program. If you are considering a distance-learning program, you should understand that a number of states do not accept these credentials. Individual schools may also be unwilling to consider graduates of a distance-learning program. It is always a good idea to check with several schools where you would like to teach to determine if the Montessori teacher education program that you are considering will meet their standards. The IMC affiliated Center for Guided Montessori Studies (www.guidedstudies.com) is fully accredited by MACTE, and blends residential and distance learning into very high quality Montessori teacher education. Salaries for teachers in independent/private Montessori schools are generally acceptable, but are normally below those offered by local public schools. Many Montessori teachers feel that these lower salaries and benefits are more than offset by greater job satisfaction and freedom from the paperwork and bureaucracy found in many public-school systems. Salaries in are often calculated on a scale based on degrees, experience and duties. Montessori teachers are generally in short supply, and in many situations Montessori certified teachers will find several schools competing for their services. For a list of the accredited teacher education programs in the US, Canada, and many other countries as well, go to either the individual organization websites, or go to the MACTE website at www.macte.org. If you are searching for a Montessori teacher education program, you might also wish to contact the Montessori schools in your area. Through them, you will obtain information as to what is available in your region and what form of certification they require? especially if you are hopeful of obtaining employment with them in the future. There are many good teacher education programs available in the United States and abroad. In the years to come, there will undoubtedly be even more, as the demand for Montessori teachers increases. The following Montessori teacher education programs are accredited by MACTE, but each is independent. Their inclusion in this list does not imply that they are accredited or endorsed by the Montessori Foundation and/or the International Montessori Council in any way whatsoever. Anyone who is interested in Montessori teacher education should contact individual programs or any external organization by which they are accredited. We suggest you read the essay Becoming A Montessori Teacher before choosing a training program. Their website has a drop down search for accredited programs on the home page. Montessori Teacher Education Programs Outside the U.S. The Montessori Foundation does not accredit nor endorse individual Montessori teacher education programs. Anyone who is interested in Montessori teacher education should contact individual programs or any organization by which they are accredited. You might want to read the essay Becoming a Montessori Teacher. Please go to the International Montessori Council’s site for details of IMC Accredited Training Programs. We have attempted to make this list as inclusive as possible for the convenience of the users of this site. Inclusion of any program in this list is not implied as an endorsement by the Montessori Foundation nor by the International Montessori Council in any way whatsoever. Similarly membership of any organization is not a guarantee of quality nor does membership of any association imply quality of an individual training program. The Montessori Training and Research Centre (Association Montessori Internationale), 3-6-361, Lady Hydari Club adj. Gandhi Medical Coll., Basheerbagh, Hyderabad, 500029, India, Phone: + 91(40) 322-8058, Fax: + 91(40) 322-9192, Email, Type of training: Casa dei Bambini, Diploma Granted: Casa dei Bambini (AMI Primary). R.T.I. Montessori Training Course, (Association Montessori Internationale), 30 N.S. Patkar Marg, Mumbai, Bombay, 400007, India, Phone: +91 (22) 367-9161/9162, Type of training: Casa dei Bambini, Diploma Granted: Casa dei Bambini (AMI Primary), Lecture Language: English, Comments: Full-time course from July to April. Aperfield Montessori Trust. Award: Diploma in Montessori Teaching. This course is NZQA approved. It can be completed by Distance in New Zealand or by Directed Distance in Christchurch, New Zealand. Montessori World Educational Institute (MWEI) Website: www.mwei.org.au mweich@paradise.net.nz (New Zealand) Contact: Beth Alcorn, Australasian Director, MWEI , 5 Glamis Place, Christchurch. North American Montessori Center (Ind – Distance Learning) 13469-27th Avenue, Surrey, British Columbia V4P 1Z1 Canada, Toll Free Voice: 1-877-531-6665, International Voice: 604 531-6665, Fax: 604 531-6698, Email, Website: http://www.montessoritraining.net, Director: Dale Gausman, Training Offered: Infant/Toddler, Early Childhood, Elementary; Graduate-Level University Credit in co-operation with Portland State University. Centro de Estudios de Educacia Montessori A.C., (Association Montessori Internationale) Pennsylvania No. 127, Col. Parque San AndrÃs, D.F., 4040, Mexico, Phone: +52 (5) 549-7573 and 549-7592, Fax: +52 (5) 549-7082, Email: cee_montessori@infosel.net.mx, Hyperlink: http://www.ceemontessori.edu.mx, Type of training: Casa dei Bambini, Lecture Language: Spanish, Comments: Minimum requirements: Bachelor Degree. Exceptions. Instituto Montessori de Mexico A.C., (Association Montessori Internationale), c/o Mrs. S. Carbone-Singh, Calle 5 de Mayo, Tepepan, D.F., 16020, Mexico, Fax: +52 (55) 5641 6484, Hyperlink: http://ami.edu/immac, Type of training: Assistant to Infancy, Diploma Granted: Assistants to Infancy, Lecture Language: Spanish and English, Comments: 0-3 Summer Course (Two summers) starting in 2003.